WIN A Spot In Spring Training! – It Works For Bobbi! WIN A Spot In Spring Training! Published on April 19, 2012 by Bobbi-Jo G.
12 Days of Fun and Inspiration! Does that sound like fun? I am lucky enough to offer one of my readers (i.e. YOU) a chance to WIN a spot in Spring Training! WAHOO! So fun. This is one prize you will want to win, I promise you. 1. Leave a comment here telling me why you want to win a spot in this class! That is a total of five entries you can do! YAY! More chances to win are always fun. Be sure to leave your email address in your comment so I can get in touch with the winner. 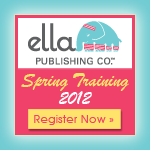 Ella is also offering 10% off Spring Training for EVERYONE who registers between today and the end of the month (April 30). When checking out, just use the coupon code SPRINGTIME10 to save your 10%! Yay! Next Winner of Spot in Ella’s Spring Training!